Fiction has many indomitable women, who succeed in what is, essentially, a man’s world. There are, perhaps, rather more ( and rather more independent ones ) in the twentieth and twenty-first century than formerly – though Lady Macbeth and Mrs Proudie might argue. But last week I learned about two, very real, twentieth century women who had remarkable success against major odds, at an exhibition which I attended. Encarnacion ‘Argentinita’ and Pilar Lopez were sisters, born in the first decades of the twentieth century. Both were dancing in private homes and in cafes as children. By the 1930s Argentinita ( the name arose because she was born in Buenas Aires) had formed her own dance company, not something easily done by a woman then. Her younger sister joined it. At that time flamenco was not considered worthy of the grand stage and it was officially frowned upon as anything other than a regional curiosity. From the outset the company was cosmopolitan one. Argentinita’s regular dancing partner was a Dutchman, Frederick Wittop Koning, who danced as Fredrico Rey. Her life partner ( they never married ) was the bull-fighter Ignacio Sanchez Mejias with whom she had two children. It was Mejias who backed ‘Las calles de Cadiz‘ ( ‘The Streets of Cadiz‘ ) their most successful pre-war production. He was, of course, the subject of Garcia Lorca’s famous poem, ‘Lament for Ignacio Sanchez Mejias‘. The sisters knew many of that generation of Spanish poets and artists of the 1920s and 30s, some of whom subsequently lost their lives in the Civil War and after. In 1936 at the outbreak of the Spanish Civil War the sisters and their company fled Madrid. Flamenco was disapproved of, as the music of the unwashed (republicans), by the Francoists. At first they performed in London, then went to New York, where they thrived. Their most famous Metropolitan Opera House production ‘El Cafe de Chinitas‘ had sets by Salvador Dali and used the texts of Garcia Lorca. Flamenco had come out of the back streets in a big way. Unfortunately, it was when they were in New York in 1945 that Argentinita died suddenly. Pilar immediately retired from dancing. But she returned to it a year later, forming her own company which she, defiantly, and despite the Franco regime, based in Madrid. The exhibition displays the sisters’ costumes and props, their travelling trunks ( they toured all over the world, including Japan ), programmes and posters from their productions. Artistic collaborators include Leonard Bernstein, Anton Messine and, in the famous gala event in London, Margot Fonteyn and Rudolph Nureyev. I like to think that this would have especially pleased Pilar, who was also a classical ballerina and who sought to merge the two forms with a third – traditional Spanish dances other than flamenco. 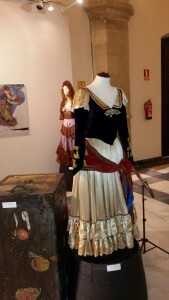 The ‘traditional’ costumes which they used are in the exhibition. There are also old cinema and TV pictures of the sisters dancing ( in a style which looks very formal and somewhat ‘sanitised’ today ). 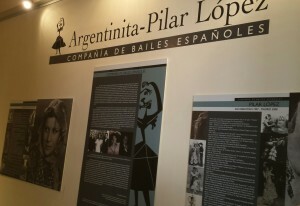 The exhibition also contains some very good, original poster art and costumes designs, many by Freddy Wittop, Argentinita’s old dancing partner, who became a well-respected costume designer for stage and screen. Pilar went on to perform at major venues through-out the world until she retired in 1973. She sought out new and talented dancers and nurtured and taught them. So Antonio Gades ( see Festival de Jerez ) was discovered by her aged 16 and it was he, when he became Director of the Spanish National Ballet in 1978, who persuaded her to teach and to choreograph many new productions even though she had officially retired. Thus, Pilar and, through her, her sister, influenced an entire generation of Spanish dancers. Pilar died, aged 101, in 2008, but until months before her death, could be seen attending new performances at the ballet. Indomitable indeed. 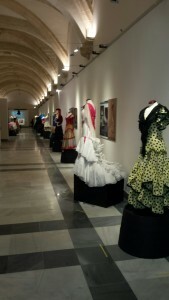 The exhibition is on at the Claustros de Santo Domingo, in Jerez de la Frontera until later this month. It is free to enter.